The United Nations refugee agency has reached towns in the strife-torn eastern Democratic Republic of the Congo (DRC), the scene of bloody attacks carried out by the notorious Ugandan rebel group known as the Lord’s Resistance Army (LRA). Over the weekend, a team from the UN High Commissioner for Refugees (UNCHR) and other UN agencies carried out a mission in the towns of Tadu and Faradje in Orientale Province. Faradje, which lies 100 kilometres west of the DRC’s border with Sudan and Uganda, was attacked from 25-26 December, leaving over 70 people dead and displacing nearly 40,000 others. Those who fled the town and local organizations said that more than 80 women were raped during the two-day period. 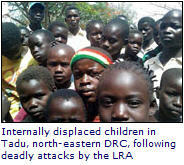 UNHCR said that people in the district are shocked and traumatized by the attacks. “Our mission found Faradje pillaged and destroyed by fire,” agency spokesperson Ron Redmond told reporters in Geneva. Over 800 houses, three schools, government buildings and health care centres had burned, with most families losing their annual harvest in the fire. The nearby village of Nagero came under attack on 3 January, claiming eight lives and uprooting 3,500 people. Up to 500 Congolese civilians have been killed since the start of a joint Congolese, Sudanese and Ugandan operation against the LRA on 14 December, Mr. Redmond said. According to UN estimates, over 50,000 people have been forced to flee their homes since mid-December, on top of 50,000 others in the region who were displaced by an earlier escalation of clashes between last September and November. Mr. Redmond said the agency has received a preliminary report of another attack yesterday on the village of Napapo which claimed up to eight lives and houses were set on fire. “An unknown number of people were reportedly kidnapped,” he said, adding that there are reports that this incident has uprooted even more people. The UNHCR team has met with local non-governmental organizations and the newly displaced are currently being registered in Tadu, Faradje and neighbouring villages.